The Scotch Malt Whisky Society is a members club devoted to bottling single casks of whisky. They concentrate mostly on Scottish malt distilleries, although they do release some grain whiskies and malts from other countries. The Society has its base in the UK with two members rooms in Edinburgh and one in London. There are also bases spreading around the world and these currently include America, Australia, Japan and throughout Europe. The collection of whiskies is extensive, covering 126 different distilleries and they bottle over 200 new casks every year. The Society celebrated its 25th anniversary last year and currently has over 20,000 members spread around the globe. For information about joining and to look through their extensive range of whiskies, visit www.smws.co.uk. The newest selection of bottlings are being released on Friday 1 May and we were lucky enough to be invited to try some of them at the London members rooms of The Scotch Malt Whisky Society. Their whiskies seem to offer great value for money and are of supreme quality as they go through a rigorous tasting panel process. All are bottled at their natural cask strength and are unchillfiltered to maximise the flavours and characteristics of the whisky. They also have a unique labelling system uses numbers rather than naming distilleries. For example, something labelled as 25.47 has 25 being the number ID of the distillery and 47 being the number of casks bottled from that distillery. The Scotch Malt Whisky Society believe that the numbering system removes any bias that people have about certain distilleries and allows members to concentrate on the aromas, flavours and characteristics of the whisky. Rosebank is a Lowland whisky and the distillery closed in 1993. The whisky as a result is running out and becoming harder to find. A great way to try it is through independent bottlings. The colour is light but golden and the nose is lovely and fresh. There is a gorgeous citrus note (think of lemon) with some sweet vanilla, something herbal (imagine fresh green grass) and a floral element (sounds strange I know, but think of roses). The palate is light and zingy with lots of that lemon and vanilla, some honey and a slight warm spicy note (reminding me of ginger). With water, it became sweeter with the spiciness becoming more prominent. The finish was shortish, crisp, very refreshing and palate cleansing with the herbal element coming through well. This Speyside distillery is relatively hard to find as a single malt. This is due to its owners, Diageo, using the majority of the whisky produced at Benrinnes for their highly popular Johnnie Walker blended range. It is well reknowned for its use of quality sherry casks and this can be first seen in the colour, which is amber with a slight brown orange tint. The nose is wonderful, sweet and rich with dried fruit (think of raisins and sultanas), caramel, something slightly nutty (imagine almonds, I think) and something bitter (think of dark chocolate). These are replicated beautifully on the palate and are joined by a grainy cereal note (almost like a digestive biscuit). This cereal element is enhanced when water is added, as is the caramel. The finish is long, rounded, fruity and complex. An excellent example of a sherry cask matured whisky and a bargain price. Hazelburn is produced by the Springbank distillery in Campbeltown. They distil Hazelburn for just one month of the year and it is unusual among Scottish whisky, as it is distilled three times instead of twice. The lack of production limits stock and this is the first cask of Hazelburn ever released by the Society. It has been matured in a Pedro Ximinez sherry cask and this evident in the colour, which is very dark and resembles espresso coffee. The nose is very rich and complicated with everything battling away together. There are dried fruit (think of raisins and candied orange peel), dark chocolate, black treacle, intense coffee, something solventy and waxy (sounds odd but think of furniture polish) and a hint of sulphuric smoke (imagine coal burning or a burning match head). This is rich, sweet and treacley on the palate and covers the inside of your mouth. The complexity from the nose makes this an intense experience with the candied orange peel in particularly prominent. With water, it becomes more sulphuric and the treacle becomes more sugary. The finish is long, rich and intensely fruity, but becomes slightly woody and tannic at the end. 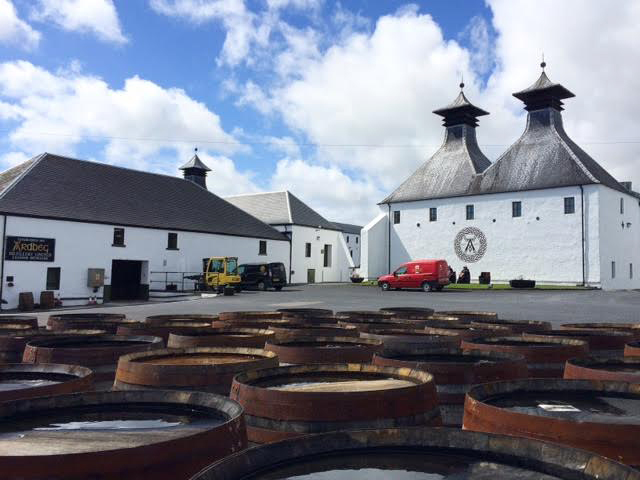 The Springbank distillery in Campbeltown has a cult following of whisky drinkers. Its popularity is based on a reputation of high quality and distinctive whiskies. This one is no different. The colour is extremely light and straw-like. This is quite salty on the nose with lots of vanilla complimenting this (a number of people commented that it reminded them of an anejo tequila or mezcal). The palate is light and refreshing with a lovely herbal note (think of dried grasses), plenty of that vanilla and an interesting citrus note (imagine grapefruit). It is all back up with a touch of smoke (think of burning embers). With water the saltiness really comes out and the initial grassiness becomes more vegetal (think of seaweed). The finish is reasonably long, salty and smoky, yet light and refreshing. Excellent whisky for an excellent price. 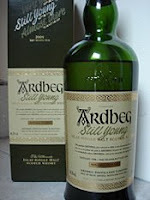 This bottling is from the iconic Ardbeg distillery on the south eastern coast of the island of Islay. It is a young whisky that is light, pale straw in colour. Initially, it doesn't seem that smoky but this starts to change with time. The smoky peatiness becomes stronger and gets quite spicy (think of black pepper). In addition, the nose has some lovely herbal notes (imagine fresh cut grass) and vanilla. On the palate, the peatiness is still spicy and is reminiscent of charcoal embers. The youthful age is evident as there are some fresh green fruits present (think of pears and apples) but these mix well with the grassiness, vanilla and smoke. There is also a slight saltiness that creeps in. With water, the vanilla becomes sweeter and the smokiness becomes more earthy (imagine damp moss). The finish is very long, spicy and peaty. Younger whiskies can be under developed and a bit harsh, but Ardbeg handles it youthfulness well as demonstrated here and in their 'Very/Still Young' range. 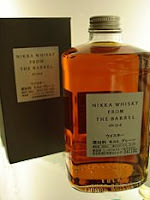 Nikka are one of the biggest producers of single malt whisky in Japan. It is a company that forms part of the massive Asahi Brewery Company and they own two distilleries - Miyagikyo and Yoichi. Miyagikyo is located on the eastern coast of Japan's main island of Honshu to the north of Tokyo and Yoichi can be found on the western side of the northern island of Hokkaido. This 'Whisky From The Barrel' forms part of a series of vatted whiskies that are released by Nikka. Vatted whiskies are produced using single malts that are mixed together. These single malts may be of differing ages and from different distilleries. They are similar to blended whiskies in this respect, but blends include whisky made from other grains. Vatted whiskies only include single malt whisky produced from malted barley. In this case, Nikka have used different ages of single malt from both Miyagikyo and Yoichi and married them together over time. 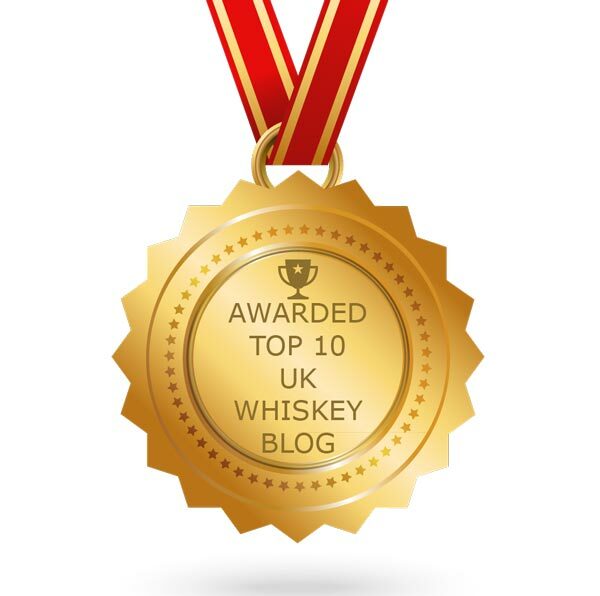 The 'Whisky From The Barrel' is a multi award winning whisky, including scooping the Best Japanese Blended/Vatted Whisky prize at The World Whisky Awards 2007. This bottle was received recently as a present and has been exclusively labelled for La Maison du Whisky shop in Paris. It is bottled at cask strength (51.4% ABV) and the colour is a golden orange brown with a very pleasant nose. There is plenty of sherry cask influence here with lots of dried fruits (think of raisins and sultanas), candied peel (especially orange), some malted barley (imagine a rustic loaf of bread) and something reminiscent of dark chocolate or espresso coffee. These characteristics are replicated on the palate. It is rich and succulent with a lovely level of sweetness and a touch of spiciness (think of nutmeg or cinammon). This whisky is deceptive and certainly does not taste or feel like cask strength. That could be dangerous on future evenings! With a drop of water, a sugary sweetness appears (imagine caramel) and the candied orange peel springs to life even more. The finish is long, fruity and sumptuous. 'Whisky From The Barrel' is an excellent whisky and one of the best blended or vatted whiskies that I have tried to date. If you have tried the Hibiki 17 years old blend from other Japanese powerhouse whisky company, Suntory, then this is in the same vein (although considerably cheaper!). A great example of how the use of quality sherry casks can influence whisky during maturation. It is still relatively difficult to find but distribution is improving to Europe and the UK. A 500ml bottle should cost £20-25 from selected independent whisky retailers. 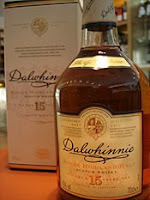 Dalwhinnie is Scotland's highest malt whisky distillery and is also one of the remotest. It is located in the small village of Dalwhinnie in the central Highlands and stands at 326 metres (1070 feet) above sea level. The distillery was founded in 1897 by a trio of local businessmen and and many thought they were mad to choose the remote location in the Grampian mountains. Infact, they built Dalwhinnie at the crossroads of the two major trading routes in Scotland at that time - one running from Inverness to Edinburgh and the other running from Fort William to Aberdeen. The village grew up around the distillery and today attracts 25,000 visitors a year, despite its remoteness. 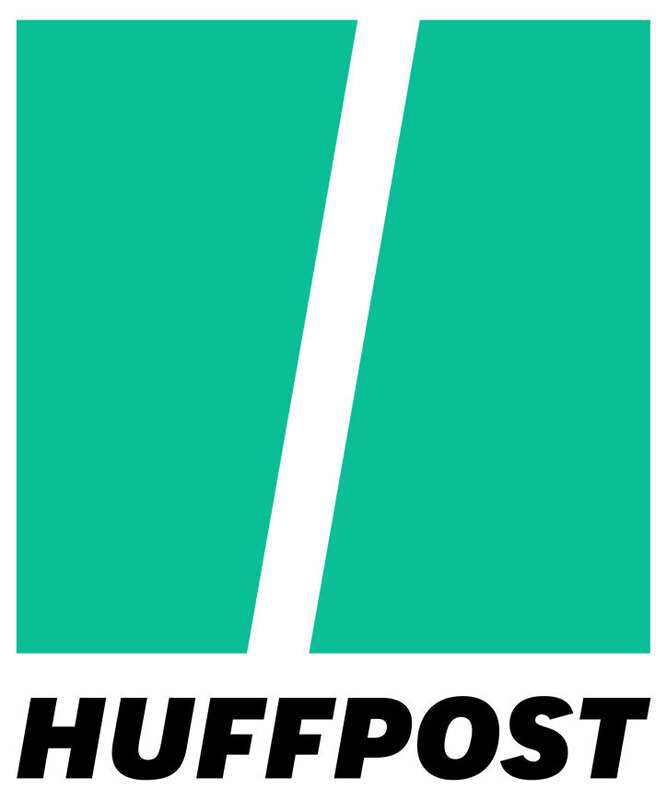 The current owners are Diageo, the global drinks company. They have placed Dalwhinnie in their 'Classic Malts' range, which showcases a definitive whisky from each of the whisky producing regions of Scotland. Dalwhinnie represents the central Highlands in the range and this has helped push the single malts in to the world's top 15 for sales, despite its small annual production of only one million litres a year. The core range reflects this and is limited to this 15 years old and a 'Distiller's Edition' which is 17 years old and has been matured in Oloroso sherry casks for the last two years. The colour is golden and the nose is very promising and aromatic. It is packed with honey and vanilla with some sweet cereal grains coming through. On the palate, this is liquid gold - heaps of honey, a touch of something floral (think of heather), gorgeous vanilla, a hint of citrus (imagine orange and orange oil especially), something herbal (think of fresh green grass) and a lovely grainy maltiness. The finish is long and rounded with the sweet honey and vanilla becoming more sugary (imagine caramel) with just a hint of some heathery peat at the end. This is an extremely good dram that is sweet but without being over sweet and cloying in the mouth. It has a succulent yet refreshing quality that balances the sweetness and it would be a great whisky to have if you enjoy sweet dessert wines such as Sauternes or Tokaji. A bottle should cost around £30. I think Diageo were right - this really is a 'Classic Malt'. An excellent malt whisky. Glenrothes is one of the largest scotch whisky distilleries in the Speyside region of Scotland. The distillery is located in the town of Rothes and has a capacity of 5.5 million litres per year. Despite its size, Glenrothes remains fairly unknown as the current owners, The Edrington Group, use a majority of the whisky produced in their flagship blends of Famous Grouse and Cutty Sark. The single malt range has recently been revamped with Edrington promoting Glenrothes more than ever before. As a result, the sales, reputation and awareness of the product are growing all the time. The restyling included the introduction of the distinctive bulb shaped bottle, minimal corrugated cardboard package and the whiskies being labelled as vintages rather than of a certain age. The core range now includes this Select Reserve (the only one with no vintage, but it is rumoured to be around 8 years of age), the 1994, 1991 and 1985. The vintage dates refer to the year of distillation. 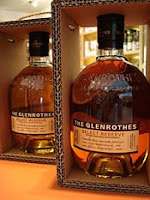 Glenrothes are well reknowned with whisky circles for the quality of their sherry casks that are used for maturation. The use of sherry cask can be seen in the colour. It is a dark golden brown with a slight red tint. The nose has a lot of fruit on it (think of dried fruits like raisins and sultanas) and this is joined by a lovely sweet cereal note (imagine a malty biscuit), something citrus (think of candied orange peel) and a hint of spice (nutmeg, I think). The overall feeling is reminiscent of a fruity Christmas cake. All of these elements combined on the palate to give a sumptuous, creamy and rich feeling. The candied peel and nutmeg spice are particularly prominent. The finish is disappointingly short for a richer whisky and some raw spirit comes through, which spoils the previous experience from the nose and palate. You often get this raw spirit appearing in younger whiskies as the alcohol has not had enough time to mature and evolve with the other characteristics coming from the cask. However, this whisky is a decent example of a whisky that has been matured in a sherry cask and worth a try for the price. It is becoming more widely available with a bottle selling for £30-35. Supernova is the eagerly awaited new bottling from the Ardbeg distillery on the western island of Islay. The whisky world has been waiting for the general release of this scotch malt, with it being touted as the smokiest whisky ever. Supernova has a peating level of over 100ppm (phenols per million). Compare this to the regular Ardbeg 10 years old and Laphroaig 10 years old, which have peat levels of just over 50ppm and are regarded as two of the smokiest whiskies on the market. Ardbeg continues to push the boundaries with their experimentation and Supernova has been released as a polar opposite of the recently released Blasda, which was their first lightly peated whisky with a peat level of 8ppm. For more information on how peat influences whisky and how phenol levels are calculated, then read Explain about ... Peat. The previous 2000 bottle limited edition of Supernova went on sale to Ardbeg committee members in February and sold out in under two hours, jamming their phone lines and crashing their website!! The colour of Supernova is a lovely gingery gold and the peatiness hits you before your nose even gets to the rim of the glass. The smokiness is very strong but maybe not as much as anticipated. There is a gorgeous sweetness that comes through and the effect is reminiscent of honey, vanilla and damp mossy earth. Once your nose becomes used to the intense sweet smoke and the high alcohol level (58.9% ABV), more subtle herbal notes come through (think of fresh green grass and leaves). On the palate, this is very peaty (earthy and mossy again) with that gorgeous sweetness from the nose giving it a rich, creamy feel. The sweetness is coming from the malted barley and has a distinct cereal note. This is joined by vanilla and something quite spicy (think of ginger) and this spiciness becomes more pronounced with time (now think of a chilli). With water, the peatiness is dulled slightly with the sweet vanilla and herbal notes coming to the fore. The finish is strong and in tense with the sweet smoky peatiness lingers on for absolutely ages. The fiery spiciness returns at the very end for one final go. This is an excellent smoky whisky. It is rich, complex and well balanced considering the very high peating level. It would be easy for the peat to overpower everything else. Supernova is available from independent whisky shops only and should cost between £75-85 a bottle. This may seem a lot to pay for a malt whisky that has no age stated (it is actually eight years old), but it is a limited edition bottling and is released at cask strength. Fantastic stuff. Aultmore is a little known distillery in the Speyside region of Scotland. It is located close to the town of Keith and is owned by John Dewar & Sons. The distillery is relatively large, producing 3 million litres per year, and is highly regarded by blenders and blending companies. Aultmore forms a constituent part within Dewar's range of blend plus a number of others, including the popular VAT 69. As a result, nearly all the whisky is used in the blending process and little is left for release as a single malt. There is no actual official release from Aultmore, with only a few limited independent bottling releases on the market. However, even these are difficult to find and are restricted to selected whisky specialist retailers. 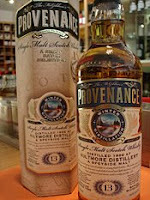 This one is released by Douglas Laing & Co as part of their 'Provenance' range of whiskies. A bottle will cost around £45. On the nose, this whisky is light, fresh and entices you to try it. There are some crisp green fruits (think of pears and apples), sweet malted barley, vanilla and honey. Unfortunately, this promise is short lived and the palate is very different. It has a sugary sweetness (think of burnt caramel) which is not too bad but this is overtaken by a slightly unpleasant woody bitterness. With time this fades and reveals nicer nutty (think of almonds) and spicy elements (imagine cinnamon). The finish is quite long and pleasant before turning bitter again right at the end. Aultmore is an obscure distillery and it can be seen that this whisky would be well suited as a blending whisky, where other whiskies join and compliment and enhance each other. As a single malt, this release is slightly disappointing following the promising start. Definately worth a try as its always good to taste whisky from different, lesser known distilleries. 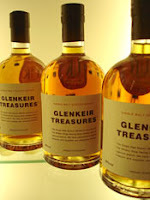 The Glenkeir Treasures are a range of whiskies that are exclusive to and independently bottled by The Whisky Shop, the UK's biggest whisky retail chain. 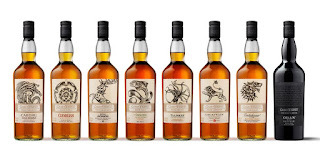 The Whisky Shop has 13 stores located in England and Scotland and this new range is available in each shop or from the website http://www.whiskyshop.com/. The whiskies have been specially selected and purchased as single casks from a variety of distilleries and cover a spectrum of different flavours. Each whisky is bottled at cask strength, which combined with the low number of bottles available from the single cask, make them limited and very desirable. This whisky comes from the cult Speyside distillery that is reknowned for its use of sherry casks during maturation. Distillery bottlings of Mortlach are hard to find as it is held in high regard by blenders, and much of the whisky is taken for blending contracts. It is popular with the independent bottling companies and through these is the best way to obtain it. This whisky is a dark golden brown and exhibits the classic sherry cask notes on the nose - lots of dried fruit (think of sultanas, raisins and candied peel, especially orange) and lots of woodiness (imagine some sort of waxy polish). On the palate, these are both present in abundance and are joined by a complex mix of something bitter (think of dark chocolate and espresso coffee) and some burnt sugar (imagine dark caramel). With water, the orange note comes to the fore. The finish is long and fruity, turning slightly woody and bitter right at the end. This is very nice and a good example of a whisky with a strong sherry cask influence. Rosebank distillery has been closed since 1993 and the whisky is well reknowned, although stocks are running out. This is pushing up the price of Rosebank and the distillery release is still sporadically available. A good way to try this Lowland whisky is through an independent bottling as a number of these companies still have stock maturing for later release. This Glenkeir release is a pale lemon colour and has a light delicate nose. Despite its lightness, there are a number of characteristics coming through - something citrus (think of lemon zest), something herbal (imagine fresh cut grass), vanilla and honey. It is also delicate on the palate with all four characteristics present with the vanilla and zingy citrus particularly prominent. With water, it becomes even more zingy and the honey element becomes stronger. The finish is short but is a good example of a light, delicate and refreshing whisky. St. Magdalene is a Lowland distillery that has been closed since 1983. As a result, whisky from there is very hard to find and is highly sought after by drinkers and collectors alike. It can only be purchased through independent bottling companies and even their stocks are running low, as nothing has been produced there for over 25 years. The distillery is now a block of flats. This bottling is golden brown in colour and the nose is full of vanilla, nuts (think of coconuts and almonds) and some citrus (imagine lemon zest). The palate is creamy but fairly light, with lots of vanilla again. This is joined by a lovely malted barley sweetness, something else sweet (think of butterscotch), more citrus notes (especially the lemon again) and something slightly herbal and bitter (imagine dried grasses). With water, the sugary butterscotch and the grassiness come out further. The finish is quite rich and long. A very enjoyable dram that is complex and rounded. This whisky is from the Speyside distillery of Glenfarclas. The distillery is well regarded for its use of sherry casks during maturation and the distillery range of bottlings is extremely popular. The owners, J & G Grant release very little whisky to independent bottling companies and when this does happen, they do not allow the name of Glenfarclas to be used. Therefore, the independent bottlers have to use some creativity to name the whisky and this one is named as 'A Very Special Speyside'. This whisky is rich, dark and golden in colour. The nose has become very complex with age - it is full of dried fruits (think of raisins and sultanas), candied peel (imagine lemon and especially oranges), some warm spices (like nutmeg and cinammon) and some sweet sugary caramel. The palate is rich and fruity with a great, rounded balance. Everything from the nose is present and you almost taste a different note with each sip. The candied orange is particularly intense. With water, this softens even more with the caramel coming through more. The finish is long with an interesting battle between the spiciness and a slight bitter woodiness. An excellent bargain for a whisky of this age. Balvenie is one of the largest and most famous scotch whisky distilleries in Scotland with an annual production level of 5.5 million litres. It is one of seven distilleries located in the town of Dufftown in Speyside and is owned by William Grant & Sons, who also own Glenfiddich. Balvenie was founded in 1892 and is a unique distillery. They have their own floor maltings (used for the germination of the barley), a cooperage where they make their casks and even grow some of the barley in the distillery grounds that is used later during production. Last year, over 1.5 million bottles of Balvenie were sold across the world putting it well inside the top 10 for total sales. 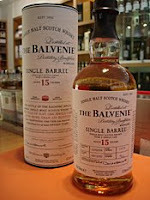 All aspects of the brand of Balvenie - its popularity and core range - continues to grow, with this 15 years old offering something quite unique for a core range whisky. It is only ever bottled from a single cask, meaning that there are never more than 350 bottles in a batch. Each bottle is hand numbered and each cask gives a subtle difference in characteristics from the next one. This 15 years old is matured in bourbon casks and offers something slightly different to other Balvenies, which tend to see bourbon casks followed by sherry or port casks. The colour is a gorgeous golden brown and the nose is full of vanilla and oak influence. There is a lovely sweetness (think of sweet cereals/malted barley and honey) and some nuttiness (especially coconut, but imagine almonds as well). On the palate, this is rich and mellow. The vanilla, malty sweetness and honey elements are present again in abundance but these are joined by a citrus note (imagine lemon zest) and a touch of something spicy (think of warm spice like ginger and nutmeg). The finish is long but quite woody and very dry. The 'Single Barrel' is exceptionally good, mellow and complex. If you want to taste what a classic scotch whisky from the Speyside region should be like, then get a bottle of this. A bottle should cost between £40-45, which is great value for a single cask release, and is available in independent retailers. Benriach is one of the last remaining independently owned distilleries in Scotland. It was originally opened in 1897 and is based in the heart of the Speyside region, near to the town of Elgin. The distillery has been closed twice, once for over sixty years between 1903 and 1965 and for a second time in 2002. The current owners, Benriach Distillery Company, re-opened and started production in 2004 and have turned it in to one of the most innovative distilleries. Benriach release a traditional Speyside style core range, of which this 16 years old is part. This core range is joined by another range of whiskies that are finished in different wine casks or made with peated malt or in some cases both. 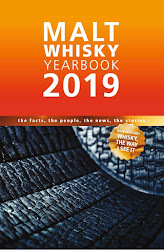 These practices, especially using peated malt, are unusual methods for a Speyside distillery and the current owners decided to do them in order to attract new customers, especially younger people and women, to their whiskies. This whisky is light for its age and straw-like in colour. The nose is again light with a lovely combination of vanilla, butterscotch and some woody nuttiness (imagine coconut). There is also some sweet malted barley coming through (think of a sweet style of bread, like rye). On the palate, this is slightly creamier and heavier than the nose indicates but is refreshing and cleansing. The vanilla and butterscotch elements are prominent and these are joined by that coconut, something also nutty but creamier (reminding me of hazelnuts), something a bit sugary (think of honey), some more malty cereals and a hint of spice (think of nutmeg). The finish is dominated by vanilla and the woodiness, with the latter making it slightly bitter. 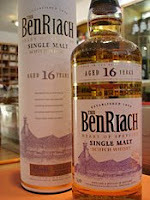 Benriach 16 years old is a very good example of a light, refreshing whisky and is complex for something of this style. It would be perfect for drinking on a warm day or as an introduction drink for someone who thinks that they don't like scotch whisky. A bottle should cost around £35 from independent retailers. The votes are coming in for our first ever readers poll and the results are starting to take shape. However, it is not too late to register your vote and change the outcome, so VOTE NOW! 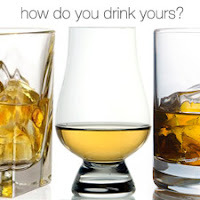 At Whisky For Everyone, we have set this poll up in order to try and find out how everyone of our readers around the globe drinks their whisky. This will help us when we are planning the writing of new articles in the future. 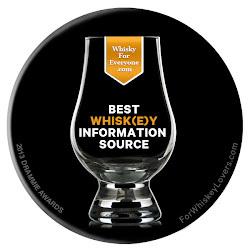 In addition, if you have any further comments about this or any articles or other ideas that you would like to see, then please leave us a comment or email whiskyforeveryone@gmail.com. If you would like a go, then just go to the side navigation bar to register your vote now. Thank you. Highland Park is located on the Orkney islands that lie to the north of the Scottish mainland. It is one of the oldest and best known whisky distilleries in Scotland and was established in 1798. It is currently owned by the Edrington Group, who use some of the scotch produced there in their popular Famous Grouse blend. Highland Park is the most northern distillery currently operating in Scotland and there are only two distilleries on the Orkneys, with Scapa being the other. Highland Park is regarded by whisky drinkers as a great all-rounder and the core range is extensive, covering different ages with the majority matured in sherry casks. 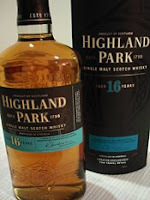 Highland Park is one of the best selling whiskies in the world. The success comes as a result of them creating a spirit which is smoky but not to the degree of the majority of Islay whiskies. It is therefore more subtle and approachable and is a good whisky to try if you don't like too much smoky flavour. This 16 years old is exclusive to the duty free/travel retail sector and we picked up a bottle for a present on our recent trip to Australia. The colour is a dark gold and the nose is very promising. There is an abundance of dried fruits (think of sultanas, raisins and candied peel) that mixes with some woody nuttiness and floral smokiness (this is acheived as they burn dried heather with the peat during the malting process). On the palate this is quite fruity (that dried fruit again) but is a bit drier and woodier than expected. The peatiness is light and fresh and mixes well with some spiciness (think of nutmeg or cinnamon), a touch of saltiness and nuts (imagine toasted almonds and coconut). The finish is quite short and dry with the smokiness and an interesting yeasty element prominent (think of a digestive biscuit). This is a good whisky that has an interesting complexity and costs around £45 a bottle (this is for a litre, as it is for the duty free/travel retail market). I certainly wouldn't complain if I received a bottle as a gift! Hellyers Road is the largest distillery on the island of Tasmania, Australia's often forgotten island state. Tasmania is home to a number of the distilleries in Australia's fledgling whisky industry, due to it having the most Scottish-like (relatively mild) conditions on the continent. Hellyers Road is located in the northern city of Burnie, approximately two hours north west of Launceston. The distillery is owned by Whisky Tasmania, which is the alcohol producing branch of the Betta Milk Company, and was established in 1997. The situation of a distillery being owned by a milk company is unusual but Hellyers Road produces single malt whisky and premium vodkas on the site. It is named after Henry Hellyer who was one of the first Europeans to land on Tasmania in 1825. The site of this first landing is on the rugged coastline a few kilometres to the north of the distillery. The single malt release is five years of age and made from Tasmanian barley, rainwater collected at the distillery and locally grown yeast. The whisky is then matured in American oak ex-Tennessee whiskey casks purchased from Jack Daniels. The colour of this single malt whisky is very light and is a lemon, straw yellow. On the nose, this is light and grassy (imagine freshly cut grass) with lots of crisp, fresh green fruit (think of pears and apples - this is a classic characteristic of younger whiskies), vanilla and a hint of citrus (think of lemon zest). On the palate the whisky feels slightly fuller bodied than expected from the light nose. It is creamy with heaps of vanilla and that grassy element again. It also has a slightly sharp sugary taste (imagine caramel) with something nutty coming through (can't put my finger on it, but it had bitterness like a walnut). The finish was very short, sharp and quite rough, leaving the taste of raw spirit in the mouth. This was disappointing as the whisky had shown good potential to this point. 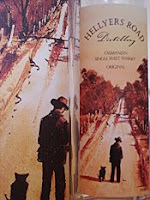 Hellyers Road's lightness and refreshing nature would make it good for drinking in hot weather or with a mixer. Distribution is spreading but is still mainly confined to Australia and some parts of South East Asia. We got to try some on our recent trip to Australia but found it very hard to find this or any other Australian/ Tasmanian whiskies in any shops. 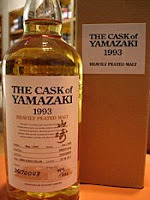 The ones we did find were extremely expensive in comparison to Scottish or other imported whiskies. This retails (if you can find it!) at $70-80 a bottle (around £35-40). 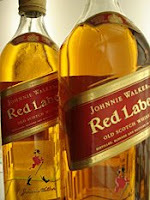 Red Label is part of the world famous Johnnie Walker range of blended whiskies. This series of whiskies are among the best selling around the globe with the Red Label forming the cornerstone of this success. It is the best selling whisky in the world and contributes almost 10% of all worldwide whisky sales. This gives the staggering statistic that every one in ten bottles of whisky sold in the world is Johnnie Walker Red Label! The success is built on the original Johnnie Walker blends being exported during Victorian times around the British Empire. As the Empire expanded, more people enjoyed the range and brand has never looked back. This is shown in the fact that Johnnie Walker whiskies were already exported to 120 countries before Coca Cola had even left America in the 1920s! The brand and the famous walking man logo are embedded in world culture and pioneered sports sponsorship in the 1960s by sponsoring a motor racing Grand Prix team and other major events, such as golf. The brand is currently owned by multi national drinks company Diageo, who blend whiskies from across their distillery portfolio including some which only operate in order to supply the Johnnie Walker range. The Red Label carries no age statement and is joined in the range by the Black Label (minimum age of whisky in this is 12 years), Green Label (minimum age 15 years), Gold Label (minimum age 18 years) and the legendary Blue Label (no age stated but the youngest whisky in it is rumoured to be 28 years old and some of the whisky is from rare and closed distilleries). So it was time to see what the fuss is about ... the Red Label is quite lively and aromatic on the nose. There is an initial sweetness that is malty (think of grains and cereals) and fruity (imagine dried fruits like raisins and sultanas), but then a nice peatiness comes through (think of damp earth) and something a bit nutty (almonds, I think). The palate is again vibrant and suggests some youthful whisky is present. That initial, almost sugary, sweetness is there again with the smokiness more prominent. It becomes quite warm and spicy (think of ginger) and has a slight salty tang also. The finish lingers and is again fairly spicy and a bit fiery (imagine black pepper). The sweetness is much less with the dried fruitiness, smoke and salt combining well. This is a decent, enjoyable whisky and it is easy to see why so it is so popular. It has complexity with a good level of sweetness and not too much smokiness. This would be good to drink straight, with a mixer or in a cocktail and is well priced at £15-20 a bottle. 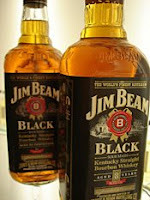 Jim Beam is the best selling bourbon in the world and sits comfortably within the global top 10 for all spirit sales. The current distillery was built at the end of the Prohibition period in 1933 in the town of Clermont, Kentucky and they also own another smaller distillery in Nelson County. The Beam family have a greater whisky heritage though, with their first distillery dating back to 1795. This was founded in Washington County, Kentucky by a German immigrant called Jacob Boehm (his surname later became Americanised to Beam). His grandson and great grandson also set up distilleries in different parts of Kentucky before they were all closed down due to Prohibition in 1920. The current range of bourbons include the highly popular flagship White Label (approximately 3-4 years old and 40% ABV), this Black Label (8 years old and 43% ABV) and the Small Batch (a combination of just a few selected casks of differing ages). On our recent trip to Australia, we discovered that Jim Beam is extremely popular there and outsells all other whiskies by a huge margin. The range in Australia includes pre-mixed cans of Beam & Coke and some bars even had this mix on tap! This Black Label has a lovely dark golden colour and the nose is packed with oak, vanilla and sweet grains. There is also further sweetness present that comes through later (imagine honey and caramel). On the palate, the vanilla and oakiness are again prominent but more complexity evolves once you get beyond this. It feels creamy and warming in your mouth (think of warm spices like cinnamon or nutmeg), with a lovely mellow sweetness (those grains and that honey again) and an interesting yeasty note (imagine a sweet style of bread like sweet rye). The finish is reasonably long with the sweetness becoming drier and oakier. The warm spices really come through well also. This is a good bourbon that has depth and complexity that some of the cheaper American whiskies lack. A bottle should cost between £20-25.